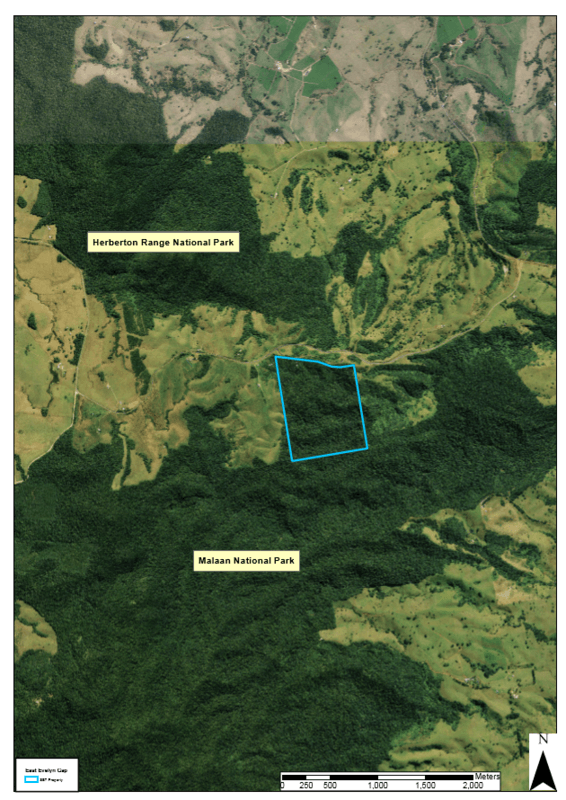 Misty Mountain occupies a critical position in a nationally significant wildlife corridor on the Atherton Tablelands. It connects the endangered high altitude rainforests of the Herberton Range section of the Wet Tropics World Heritage Area to our Cassowary Crossing Reserve and thence to the greater part of the World Heritage area all the way down to the rainforests of the coastal plain. Without Misty Mountain these two major sections of the World Heritage Area would be separated forever. Our purchase of Misty Mountain was very generously supported by the Rainforest Trust (www.rainforesttrust.org) who were concerned to protect both this critical linkage in the WHA and the range of endangered and near threatened species whose long term survival is dependent upon such linkages. simple to complex notophyll vine forest of cloudy wet and moist uplands and highlands on granites and rhyolites. The former of these rainforest types was previously largely cleared on the property due to the rich basalt soil. Much of this area has subsequently regrown such that there is a large area of 20 to 40 year old regrowth rainforest on the reserve. Unfortunately, under Queensland law such regrowth forest can be cleared without a permit, an event that would have put the creation of a viable corridor back 40 years or more. With the purchase of the reserve in 2017, such a risk has now been averted. This corridor is of particular importance for the nationally endangered Cassowary and Spotted-tailed Quoll. The reserve also provides habitat for the nationally vulnerable Greater Large Eared Horseshoe Bat and three nationally endangered frogs: the Common Mistfrog, Mountain Mistfrog and Australian Lacelid. The critical importance of the corridor also arises from the very significant threat that climate change poses to a whole range of endemic cooler climate Wet Tropics species. Without functional connections within fragemted habitat areas it is feared that the long term survival of a range of near threatened species will be substantially at risk. These include Lumholtz's Tree Kangaroo and the Lemuroid and Green Ringtail Possums which are restricted to the cooler parts of the Atherton Tablelands and other higher areas of the Wet Tropics.